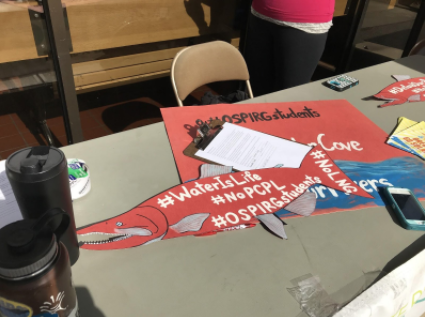 Last week, Southern Oregon University’s chapter of the Oregon Students Public Interest Research Group (OSPIRG), had their Week of Action for their lead campaign: Defend Our Rivers. 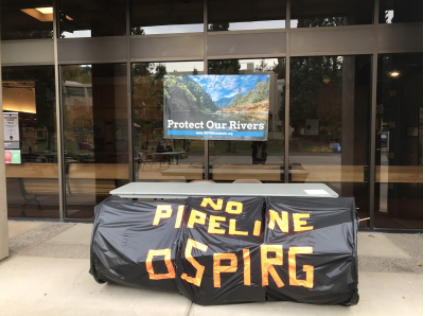 The group had intended to march their life size recreation of the pipeline Jordan Cove Liquefied Natural Gas pipeline [LNG Pipeline] throughout campus to “Let people know that there was a pipeline just being kind of loud and obnoxious and in your face.” said Nina Friedman, SOU OSPIRG chapter chair. Due to a lack of volunteers, however, the group was unable to parade the pipeline through the campus. It was displayed in front of Stevenson Union throughout the week. OSPIRG attended the Oct. 17 ASSOU meeting to gain support from the student council, and the Student Body Resolution was approved at the meeting last night. Now, OSPIRG can apply for a Faculty Senate Resolution. For the past week Friedman has led her group through a series of activities to get support for the campaign. With a life size recreation of the pipeline and a petition, the organization has gathered over 1000 signatures opposing the pipeline. OSPIRG’s main target for this campaign is Governor Kate Brown. Friedman explained, “She has the power to direct state agencies, and she has the power to ultimately say no to the project.” Along with the 1000 signatures, OSPIRG ran a social media petition where students take a picture of themselves signing the petition to directly show Gov. Brown that they do not support the pipeline. According to the Rogue River Keeper, since 2016, a Canadian energy company, Versen, has been attempting to establish a massive pipeline, the Jordan Cove, to transport fracked gas from Canada to Southern Oregon. The pipeline will end in Coos Bay, Oregon to better transport the fossil fuel onto ships bound for Asia. At 232 miles long and 3 feet in diameter, this pipeline will cut through private tribal lands and sacred burial grounds.